It is incredibly important to expose equality data. 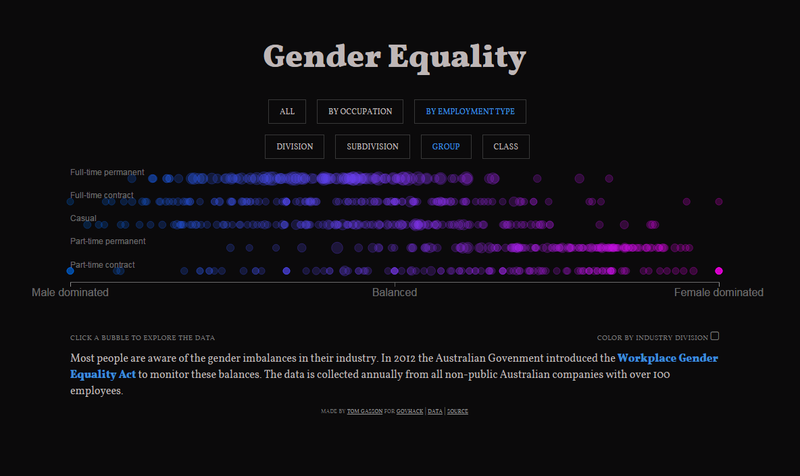 I've build a data visualisation of gender equality data from the Workplace Gender Equality Act dataset. The site was designed for two main users. Hiring managers, CEOs and Human Resources need to be able to comapare themselves to their industry partners. This often doesn't happen because the data is not hosted in an easily accessible format. With this tool, a hiring manager will now be able to recognise when their company is falling short of the industry benchmark and will be in a powerful position to influnce change both specifically with hiring and with internal policies. It is also designed for the general public to make them more aware of the gender balance across industries. Whilst there may be plenty of action and encouragement for balance in some industries, there are also many that are left out of public opinion. I hope that this tool can help inform that public opinion. The site is built as a single page web application in d3 and react.js. The data came nicely as csv. I've had to compile a dataset of ANZSIC industry codes (https://github.com/tomgasson/gender/blob/master/data/codes.csv) because they came as a terribly formatted excel workbook. Hopefully someone else can find them of use now.